Increasingly I've been seeing the argument that the EU isn't perfect, but it's better to stay in to prevent the evil Tories from gaining more power. 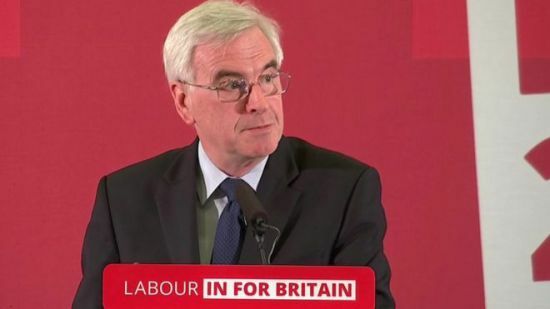 This 'Tory Brexit' argument, as John McDonnell calls it, is the most vacuous I've seen from the remain side. There are sensible, cogent arguments to be made for staying in the EU, but this is not one of them. It's incredibly undemocratic, short sighted, and fantastical. It misses the entire point of the democratic argument for leaving the EU. Those of us that advocate doing so in order to reclaim power from Brussels, aren't doing so to give that power to the Tories, or Labour, or whatever political party happens to command a majority. It's to give that power back to the UK Government, and by extension, the UK electorate. We do not need a supranational entity comprised of unelected bureaucrats to provide a backstop to the UK parliament, that is the job of us as voters. It is not for Jean Claude Juncker to hold the British government to account, it is for you and me. The insinuation of course in this line of attack, is that were there a Labour, or left-wing government currently residing in Westminster, then these people would have no problem in voting for Brexit. I'm not entirely sure when these people expect that to happen, especially considering that Labour have seen fit to elect their most euro-sceptic leader in decades and he is still campaigning for remain, and by extension, the overrule of the democratically elected UK government by the unaccountable EU commission. Tony Benn must be spinning in his grave at this betrayal of the left's historical democratic principles. He was a man who could see that the short term fear of the opposition occasionally implementing policies when in government was not enough of a reason to neuter Westminster entirely. It's also an incredibly short sighted, and indeed selfish, view of the issue. Granting the presumption that everything the UK government currently does is appalling and everything the EU does is wonderful, there is absolutely no guarantee that that will always be the case. If by some miracle Jeremy Corbyn wins the election in 2020, many of the left wing policies he advocates are incompatible with EU law. He cannot offer state aid for the UK steel industry. Nor can he re-nationalise the railways. If the left truly wish to see the back of Cameron and his policies, they should enable a left wing party to do so in the event of it winning an election. But their short-termism in seeking to remain in the EU to apparently muzzle the Tories will not allow them to do that. There is a complete lack of democratic principle in this argument. Were it myself, and we currently had an uber-socialist government being overruled by an uber-libertarian EU commission, I would still vote to leave. The argument for leaving the EU is ultimately not a left wing nor a right wing one. Nor is it a capitalist or socialist one. It is a democratic one. We're not voting to choose a government tomorrow, we're voting on who should have the power to decide a government. It must be us, and only us.